This adventurous camping tour travels from Johannesburg to Cape Town, viewing the incredible wildlife of the Kruger Park. Drive through Swaziland to St Lucia Durban. Continue through the Drakenberg Mountains into Lesotho & along the Garden Route to Cape Town. Travel in a rugged overland truck, with dome tents & activity package included. Regular departures with group size 4 to 18. This morning you will be collected from your Johannesburg hotel and taken to the departure point for your group adventure tour travelling in a rugged 4x4 overland truck. We then travel 7-hours through the farmlands and mountains of Mpumalanga along the beautiful Panorama Route. This is one of South Africa’s most scenic drives and includes Bourke’s Luck Potholes, Gods Window, the three Rondavels and the green Blyde River Canyon - the third largest in the world. We continue to our campsite where you may see bushbabies, duiker, giraffe, impala, wildebeest, bushbuck and warthog grazing. We rise early today to visit Moholoholo Wildlife Rehabilitation Centre. Here you have the unique opportunity of viewing wild lion, leopard, cheetah, eagles and vultures at close quarters. Animals found injured, poisoned or orphaned are given a second chance and released back into the wilds. This is a wonderful opportunity to see some very special species up close, as well as learning about the positive achievements being accomplished here. Later we enter the world famous Kruger National Park for unforgettable game viewing. Our truck gives us a height advantage over other vehicles, which means better photographs. Game viewing opportunities should present themselves almost immediately in this vast 2-million hectare game sanctuary that is the size of Wales. Note: Moholoholo Wildlife Rehabilitation Centre is closed on Sundays. Today enjoy game viewing in the famous Kruger National Park, travelling in our overland truck. 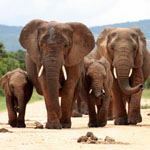 We search for the Big Five - lion, elephant, rhino, buffalo and leopard - as well as many smaller mammals, insects, reptiles and birds that live in this amazing wildlife reserve. After a beautiful African sunset, enjoy the balmy evening and pristine stars of the Milky Way as you have never seen them before – as well as the spectacular Southern Cross. Relax amongst the wildlife of Mlilwane Wildlife Sanctuary, Swazilands oldest game sanctuary covering over 4,500 hectares. As there are no large predators you can enjoy walking in the reserve, which is an excellent way to enjoy the flora, fauna and bird life. We leave Swaziland today and re-enter South Africa, travelling 5-hours to the small town of St Lucia, which forms part of the iSimangaliso Wetlands. This area has been declared a World Heritage site because of its unique biodiversity and importance to marine conservation. With over 500 different bird species, it also offers outstanding bird watching. In the afternoon enjoy a Zulu cultural experience, including energetic Zulu dancing and sampling the local beer. You will also be taught how to greet and count in the Zulu language, and learn about family traditions. This morning we drive to the Hluhluwe Game Reserve for an open top game drive in a 4x4 vehicle with a ranger. This Big-5 game reserve is renowned for saving the rhino from extinction and now has the largest population of white rhino in the world. In the afternoon we continue 4-hours to Durban, South Africa’s largest marine port and well-known holiday destination. The evening can be spent enjoying an optional dinner out, where you can sample authentic Indian cuisine - as Durban is home to the largest population of Indians outside Asia. We leave behind the beautiful beaches of Durban today and travel 5-hours inland to the spectacular uKhahlamba Drakensberg Mountains, recognised as a World Heritage site for its vast collection of San Bushmen rock art paintings. Known locally as the Barrier of Spears the dramatic Drakensberg Mountains form the backbone of Southern Africa, running all the way down from the Great Rift Valley. Here you can explore the mountain paths and take in the breathtaking views offered in the Royal Natal National Park. Today enjoy a guided hike in Royal Natal National Park to see ancient San Bushman rock paintings. Other optional activities in the area include horse riding, abseiling, mountain biking, Tugela Falls hike or a visit to a local Zulu school. A full day on the road today enjoying dramatic views, as we travel 8-10 hours across the Drakensberg Mountains into the landlocked mountain kingdom of Lesotho. Lesotho is the home of the Basuto people and one of the highest countries in the world, at over 1,000 m above sea level. At leisure to enjoy walking and hiking in the magnificent mountains of Lesotho. There is also the option of Pony Trekking into the remote hills, accompanied by local guides. In the late afternoon we will visit the local village and school (except during school holidays). A full day on the road today as we leave Lesotho and travel 8-9 hours southwards to Cintsa. On arrival relax on the glorious beaches of the stunning Wild Coast of South Africa. At leisure to relax and unwind at Cintsa on the beautiful Wild Coast. Optional activities include boat rental, quad biking, abseiling and local Xhosa Village visit - or simply relax on the magnificent beach. A full day on the road today as we drive 8-hours from the Wild Coast to the Addo Elephant National Park in the beautiful Eastern Cape. Our truck gives us an elevated view on our game drive this afternoon, particularly for those photographic enthusiasts amongst us. In addition to the elephants, you can hope to see antelope, zebra, wildebeest, giraffe and other plains game, as well as several of the Big Five before dining in your warm African surroundings. You can also take an optional night game drive with an Addo ranger. This morning we leave Addo and travel 1-hour to Port Elizabeth airport for a quick stop, before we continue 3-hours to the Tsitsikamma Forest. Meaning "place of abundant water", Tsitsikamma is one of South Africa’s best-kept secrets with exceptional hiking trails through indigenous forests and superb coastal scenery. On arrival relax and explore the scenic beauty of the forest. Today is free to explore the first few hours of the famous Otter Trail Hike. Alternatively many optional adventure activities are available in Tsitsikamma - the adventure capital of South Africa - including black water tubing down the Storms River, abseiling down Storms River gorge, an exciting tree-top canopy tour or bungy jumping from Bloukrans Bridge, the highest commercial bungy jump in the world! Today we travel 2-hours from Tsitsikamma Forest to Plettenberg Bay. In the afternoon you can choose between relaxing at the resort or taking a short excursion to nearby Knysna, where optional activities include a Knysna Lagoon cruise, Knysna Elephant Park, Township Tour, Monkeyland & Birds of Eden. Today we travel 2-hours from Plettenberg Bay along the beautiful Garden Route and through the magnificent Outeniqua Mountains to Oudtshoorn. On arrival in Oudtshoorn we visit the world-renowned Cango Caves – a vast series of underground halls and caverns formed over 20 million years ago in the foothills of the Swartberg Mountains. The caves, which extend for over 3 miles, contain spectacular stalagmites and stalactites and offer relatively easy access. This morning there is the optional opportunity of visiting an Ostrich Farm to view these huge flightless birds in their natural surroundings. We then enjoy a scenic 5-hour drive along spectacular Route 62 to Stellenbosch. On arrival we explore this historic university town, which is at the heart of the Western Cape’s wine region and second oldest European settlement in the Western Cape. As this our last night together, in the evening enjoy an optional dinner at a local restaurant. This morning we visit a Stellenbosch wine estate to taste some of South Africa’s finest wines. We also visit a Cheetah Breeding Project to see the work being done to save this endangered species. We continue 1-hour to Cape Town, where on a clear day you can enjoy magnificent views of Table Mountain. Your tour ends with drop off at your hotel. Today is free for independent sightseeing in Cape Town. We recommend you purchase a day pass onboard the convenient Hop-Off Bus, which stops at all Cape Town’s key sights and beaches. The "Red Route" bus stops at the Table Mountain base station, where you can buy a ticket to ascend by cable car and enjoy one of the world’s most famous views. Continue to Camps Bay beach and the many attractions of the Victoria & Alfred Waterfront. At leisure to relax and explore the "Mother City" of Cape Town. Many optional activities are available in this beautiful city. You can visit Robben Island where Nelson Mandela was imprisoned (advance booking essential in season) and explore the vibrant Victoria & Alfred Waterfront. You can also take the Hop Off bus (Blue Route) to visit world famous Kirstenbosch Gardens, enjoy a city tour or simply relax on golden Camps Bay Beach. Day tours can also be taken to the winelands of Stellenbosch & Franschhoek. Today we recommend an optional full day shared tour to the beautiful Cape of Good Hope Nature Reserve, where you may see baboons, ostrich and perhaps even dolphins or whales in season (July/November). Your tour travels through Hout Bay and along spectacular Chapman’s Peak Drive to the Cape Point peninsula, returning via Simons Town, Fish Hoek, Constantia and Kirstenbosch Gardens. This is a scenic tour of the whole Cape Peninsula, with the optional opportunity of visiting the penguin colony at Boulders Beach. Transfer to Cape Town Airport for your flight home.